We left our roses in the yard of The Little Bitty in the Syracuse city neighborhood of Eastwood when we departed for the Liverpool neighborhood of Galeville in October. My dear wife Karen will not allow the grounds of A Bitty Better to remain rose-less. Of that I am certain. 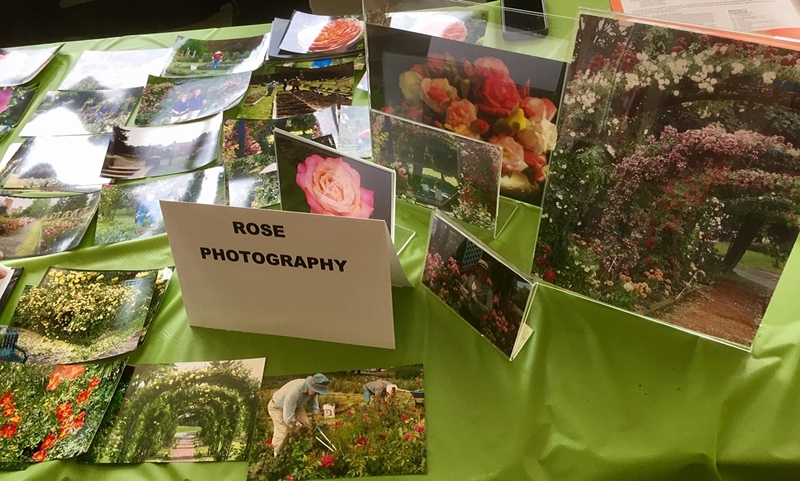 So I made sure to put the Syracuse Rose Society’s Rose Fair in the Liverpool Public Library on our schedule when I was doing my communications specialist job and spotted the event on our slate months ago. The folks from the Society call themselves Rosarians. Cool description. And they came loaded with brochures and tips. Karen went from table to table, eager to learn. I used my iPhone 6s to take photos, including the exhibit of rose photos. After, Karen had a sharper focus of where she wants to put plants where in the coming weeks. If you’re a rose lover, where are the plants you most admire? Hey Mark, this looks really cool! Lovely that Karen wants to have the garden so beautiful. My nonna has these lovely white roses in her garden. When it rains, they look so beautiful. That’s a great sight for you, my friend, your nonna’s white roses. Enjoy! I’m always thinking admiration for your posts, Mark. Oh I loveeeeeeeeeeeee roses and have a rose garden with 30+ rose bushes. its so pretty and fragrant Terp! Good Luck with the planting! Gatorette. That sounds magnificent for your Florida yard, Gatorette! I’m admiring the thought of it! YDW Karen will have a great one too! Woo-Hoo Tetp! I love roses too. My yard is full of roses from heritage plants to floribundas and grandifloras. Our yard smells so sweet starting in late May. Perhaps Karen might enjoy a “Betty White” or perhaps a “Mr. Lincoln”. While my personal favorite is an “Abraham Darby”. It is a yellow rose with delicate stems. Huge flowers and a sweet fragrance that would make perfume makers (noses) green with envy. I would love to see and smell your yard, Tracy. Thank you for the great rose suggestions, my friend. Thank you so much for visiting, Ben.